What a fantastic finished look. 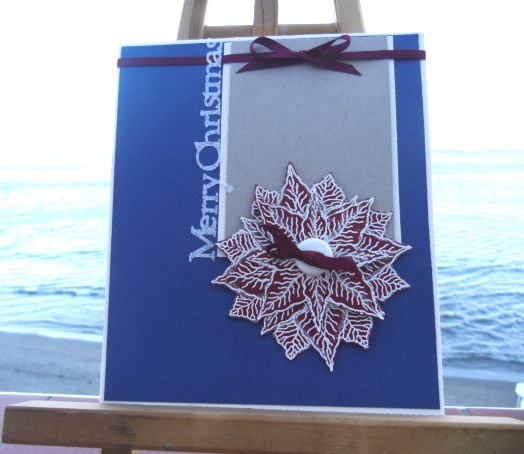 Loving the layout of this and all of the gorgeous layers you have put into the poinsetta. I'm not sure where the time is going Sylvie .. .. all I know is that you have posted some fantastic creations since I was here last. You really use your Penny Black stamps magically! Another gorgeous creation! Miss you at LIM! I'm looking forward to the New Year and to entering lots more challanges as Xmas does get in the way - LOL!! Hope you have a lovely Christmas and thank you for your sweet message on my blog (as always). Gorgeous card, love the deep red poinsettia. It really lovely fantastic card.This one is look really cool.I like this card color combinations. Enjoyed all your cards, and also enjoyed my visit to Gibraltar a few years ago! Been a bit remiss in comments the last few months, but would like to wish you a Very Happy New Year.